Passionfruit Tea, a photo by megan_n_smith_99 on Flickr. I am feeling a fair bit better. I had another doctor's appointment yesterday. I don't think I have left the house other than trips to doctor and pharmacy in I don't know how many weeks but hoping to change that today or tomorrow. I like to listen to audio books while I knit and paint. Right now I am listening to Beggars in Spain by Nancy Kress. It's very interesting. It's about a future where genetic enhancements are common and one of the enhancements is sleeplessness. But it leads to class warfare between the sleepers and the sleepless. I like books that make you think a little. It sort or reminds me of some of Kate Wilhelm's science fiction. 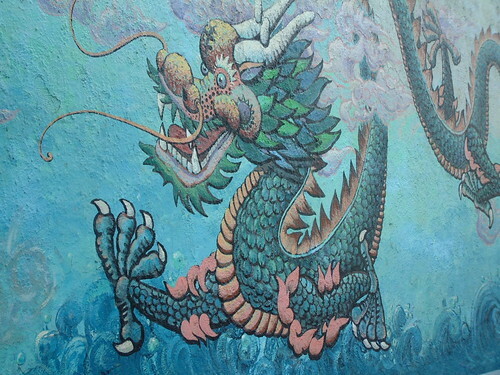 dragon mural, a photo by megan_n_smith_99 on Flickr. In honor of the year of the dragon, This is a photo I took in SF in 2008. It was someplace in Chinatown. I have only been to SF once but my favorite parts that I saw were Chinatown and the Mission District. There was so much to see that I hope to go back one of these days. This weekend I have been working on a new little series of tea themed paintings. I'd like to find some tea houses to show them in. I do have one scheduled for October, but that's a ways away. These paintings are 5 x 7" so would be easy to ship even framed. 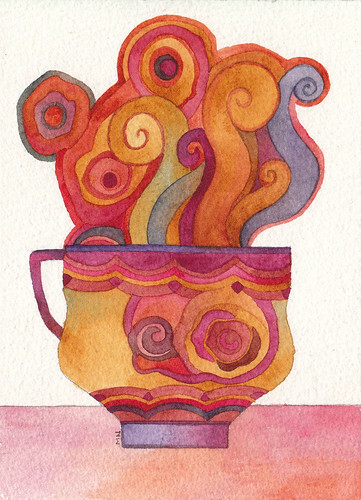 If you know of any place that might welcome a show of Tea themed art, let me know! And we'll see - maybe I will have one as the February give-away. I have been feeling quite under the weather but yesterday was nice. My friends Janusz and Alex came over and brought me gluten free bread and pho. I have barely left the house other than the pharmacy and doctor's appointments and had not actually done anything social in weeks so it was nice to have some company. Today I've painted some, knitted a bit, and then when I felt anxious and needed something to do with my hands I wound two 440 yard skeins of yarn into balls. I don't have a swift or a ball winder, I just do it the old fashioned way, which depending on how you look at it is either inefficient or meditative. I think it will soon be reading in bed time. I know the excitement in my life is nearly breathtaking. dollbook10, a photo by megan_n_smith_99 on Flickr. I am at the moment particularly enjoying purple and orange together, also hot pink, magenta, or fuchsia and orange together. In the early days of my beading, when i was just out of my teens, I did a lot of monochromatic bead embroidery. It was very pretty and subtle and I still do like using white and ivory together. In the mid 90s, when i started working for Dale Chihuly, taking care of and tracking his artwork, I was surrounded by amazing color every day. You can't see that sort of thing every day for 15 years and walk away untouched. The basic aesthetic of my work has not changed but somewhere along the line my use of color did. I am now quite comfortable using unexpected color combinations and contrasting colors together. I can't remember exactly when I created this doll - I'd have to go back and find my notes - but it must have been late 90s to early 2000s. If you look closely you can see the dolls represent Yin and Yang and the colors flow from one doll to the next. 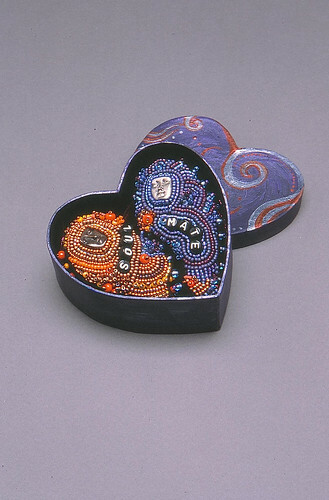 Both dolls can be removed from their velvet lined box and are beaded on the top and the bottom. 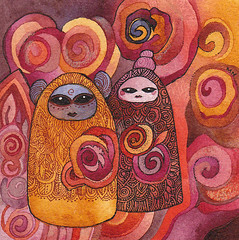 And I am also working on some watercolors now that feature orange and purple together which is what made me think of this doll. 063007art1, a photo by megan_n_smith_99 on Flickr. Here we have another dragon that I painted a few years ago. 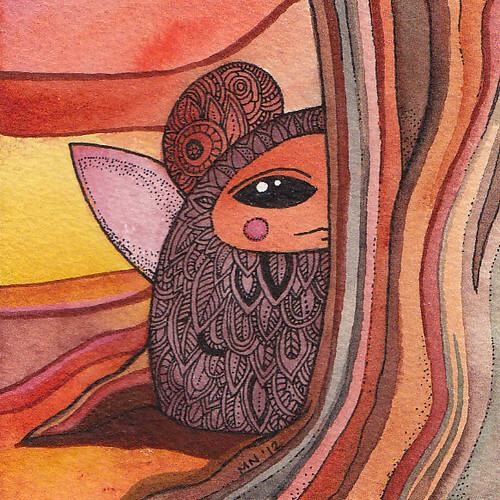 It is 6.5 x 3.5 inches, watercolor and ink. 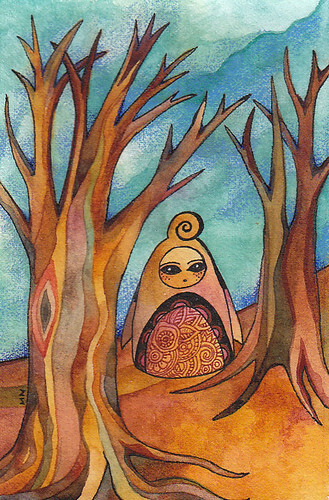 I think for this one I did the ink 1st, then the watercolor -- lately I've been doing it the other way around. Also this must not be the same paper I am using now. This is probably some relatively inexpensive paper, maybe some Strathmore 140 lb. The Arches really drinks in the pigment, allowing for more intense colors. I am feeling a bit better than I have in a week actually. The medication I added is helping. I do still feel completely wrung out and exhausted, though. I tried to tidy up a bit but you can barely tell. And I sent out some resumes. I think it is time for a nap now. A friend sent me this link. I am not one for posting LOLcats every second or anything like that, but this cheers me up: Dormouse napping. True Blue, a photo by megan_n_smith_99 on Flickr. I've listed a couple of small Valentine paintings in my Etsy Shop. I think they would make nice gifts, and of course sometimes you need to buy yourself a gift. I went to the doctor today and was given a new RX and told to increase the dose of another RX I already have, and told what guidelines to use to decide if I need to go to the ER this weekend so I guess I am set. And I do feel slightly better. I've not done anything social in over 2 weeks between snow and feeling so poorly. Doesn't January just seem to last forever sometimes? dragonprisma, a photo by megan_n_smith_99 on Flickr. Ok. I am a little late. 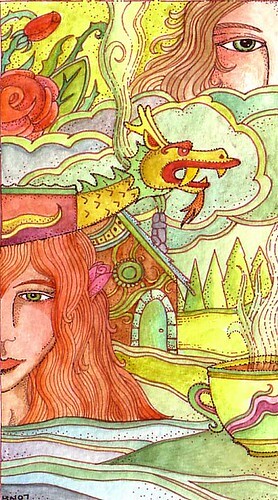 This is an example of the sort of artwork I did in my teen years. 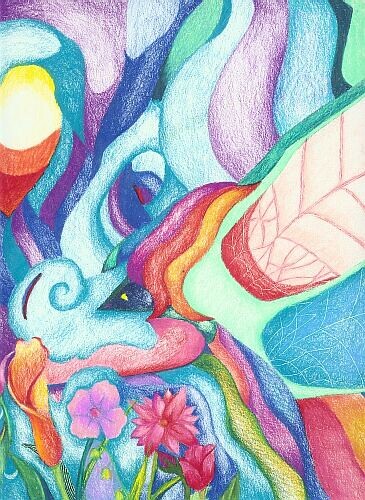 Between the ages of 16 and 19 (or so) I drew just about every day, going through a steady supply of Prismacolor pencils. Speaking of Prismacolor Pencils, would any of you be interested in my re-presenting a Prismacolor tutorial that I wrote a number of years ago? I could do that if there is interest. I still feel awful but am off to the doctor in a few minutes. 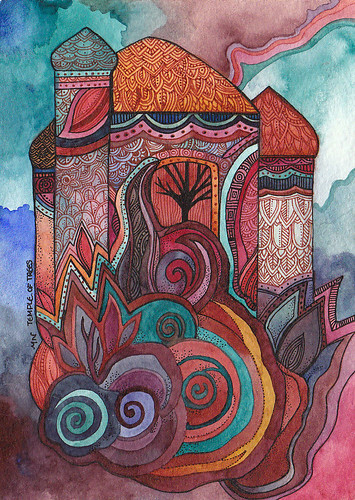 Palace of Dreams, a photo by megan_n_smith_99 on Flickr. 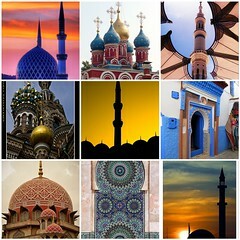 I have been taking my minaret series into more of a fairy tale land. Actually, I may end up assigning these newest works to a new series, once I figure out where I am going with it. 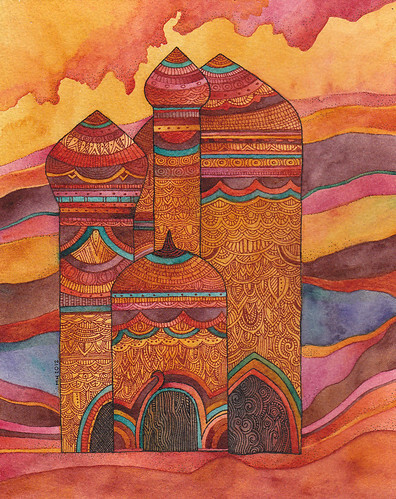 The onion domes and minarets are still present, but as for the rest it's gone into a more fantastical land. Speaking of which, I could swear that when I was growing up I read a fairy tale about a castle build of ice cream. Does this sound familiar to anyone? I'd love to know if this is a real story or just something I dreamed up. Still not feeling well but I am going to the doctor tomorrow. Actually I think I will make another doctor's appoint as well, I probably need to see both of them. 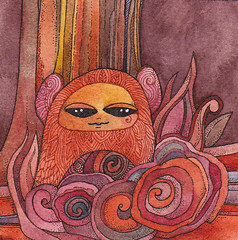 I am going to take it easy today but If I feel well enough I will finish 2 little watercolors I am working on. Art keeps me going somehow. 081907alice1, a photo by megan_n_smith_99 on Flickr. 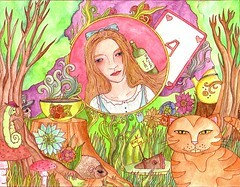 In honor of the fact that I am reading about Charles Dodgson / Lewis Carroll I decided to share this painting I did a few years ago - my own interpretation of Alice in Wonderland. Naturally I included one of the hedgehogs who were used as croquet balls. I am really surprised I did not included the dormouse, but he was probably asleep in some hidden nest. Perhaps I should do another one based on the Tim Burton movie since he had some very different - though equally delightful notions of "what Alice found there". I am still feeling quite poorly but I made a doctor's appointment for Thursday. Lotus Scarf, a photo by megan_n_smith_99 on Flickr. I made this from one skein of Madeline Tosh Vintage. The color is called tern. 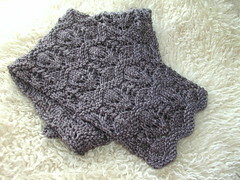 It is a short scarf that I plan to wear indoors as a fashion accessory with a brooch. The pattern is available for free at Knitting Daily. I cast on 31 stitches. Marshes and Waters and Creatures Therein, a photo by megan_n_smith_99 on Flickr. I am still feeling under the weather but I may have some knitting to show you later! 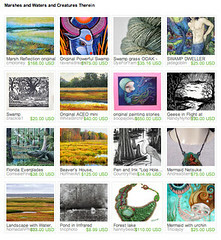 In the meantime this is a treasury I made on Etsy - perhaps you will find it inspirational. My creation, a photo by megan_n_smith_99 on Flickr. 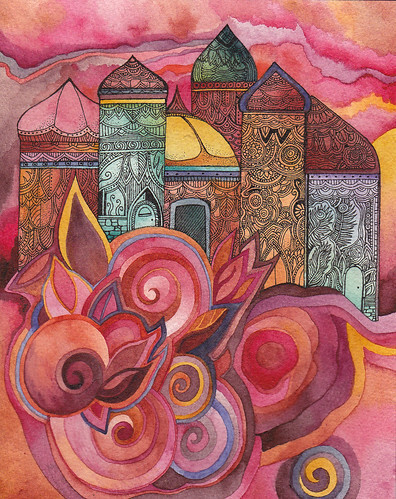 I am working on a watercolor I really like but did not do much of anything yesterday - I am feeing particularly unwell. I did read and knit a little bit. i am going to make a cup of tea now and read some more. The snow is mostly gone, one wind storm swept through, and I think another will hit soon. The weather is rarely dull around here. I am on my 3rd bio of Charles Dodgson / Lewis this year. I guess when I investigate a subject I want to learn everything I can about it. Creature in Winter, a photo by megan_n_smith_99 on Flickr. Here we have a creature in the winter I usually know with bare tree branches reaching into the sky in lacy patterns. At my house at least things are returning to usual - most of the snow has melted, but howling winds have moved in and i see branches and shingles down. (The shingles are not from my house!) I live near sea level and I just hope a lot of snow has already melted at higher elevations because this wind will be bringing down trees and branches and i hope they are not encased in ice - that will just do more damage. well, there will be more power outages. I hope my parents are not among them. Their power was out for about a day and a half this week. Where I live the wires are underground for the most part and outages are not common. Also I live a couple blocks from the hospital and fire station so this area would be a high priority to get back up. "Today the still-growing weight ad bulk of the Alice Liddell mythology flattens out Dodgson's monopolized life like a flayed skin"
"his self-loathing spills out to encompass everything about himself like a fat woman in front of a mirror"
"A vein of maudlin and humourless sentimentality ran through the middle of his deepest nature and expressed itself with lachrymose vulcanism when roused." so... uh, good thing it is an interesting topic. I don't feel well today so I think I will read in bed for a while. Possibly a long while, like all day. We'll see. Autumn Tree, a photo by megan_n_smith_99 on Flickr. Edit: I decided I did not gush enough about Cherie Priest. Although the vampire novels are not my favorite of hers they WERE enjoyable and well written. And I just love her other books, especially Boneshaker and Wings to the Kingdom. I have a fondness for civil-war fantasy and you know there really isn't very much of it! Well, there's still snow on the ground. I don't think I would call myself technically snowed in, but I can't think of anyplace I want to go enough to brave the cold! I'll figure out something to do tomorrow. I've been knitting and painting and reading and watching some DVDs. I finished Cherie Priest's vampire novels. Bloodshot and Hellbent. She definitely is a better writing and crafter of plots than I lot of people writing vampire novels, so if you are interested in the genre I suggest you give them a try! I enjoyed them but prefer her other series. 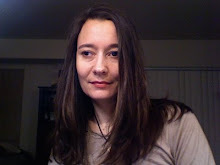 She wrote a sort of southern gothic series (the Eden Moore series) and a steam punk series (Clockwork Century). I really like the Eden Moore series and the steam punk series is a lot of fun. My favorite of those was Boneshaker, which features some Seattle history and parts of which are set in the Seattle underground. You can get more information on her website. Palace at Sunset, the weather, and creative road repair. Palace at Sunset, a photo by megan_n_smith_99 on Flickr. Seattle continues to be shut down and frantic about it. We don't have enough snowplows and things, but really that is not something I would be spending money on now if I was in charge. Because it really does not snow very often and it's probably cheaper and safer to have people go into hibernation mode for a few days a year (if that) rather than spend a lot of money on equipment. Now if we had any extra spare cash around we could fix some potholes. That would improve driving conditions in any weather. I live near the old part of Ballard. It used to be downtown, until the main business zone shifted north to Market Street. For a while it was the shabby part of town - the part of town where you went to find beer or a brothel. Now it is trendy again, and the dive bars have mostly been replaced by hipster bars and boutiques. It's a pleasant place to go for art walk, the sunday market, live music, and my favorites: an amazing toy store and a gelato place. Anyway, this area was once paved with bricks that now have a thin layer of asphalt over them, and the asphalt has been known to wear away. I saw a pothole down there that someone had done a do-it-yourself repair to: filled it with trash (mostly flattened tin cans) and covered with several layers of duct tape. Needless to say this was being worn away or I would not have been able to see what was under the duct tape. But I offer up points for creativity. This is my latest painting and I am very happy with it. I am not always entirely happy with my paintings. Often I am feeling pretty mixed about them and put them away for a few days but then get them back out and decide I am pleased after all. And in this case I was pleased to he happy with my painting without having to go through the separation step. I'll be staying in today and amusing myself, we'll see what I come up with. I'm not feeling so great. I think eating healthy this week has actually made me feel worse, but I have some GI / food intolerances which I very tricky to deal with. Aren't I chatty today? I realize I have not socialized other than on-line in over a week. I did not try to go to my knitting group last night and I doubt anyone else did either. I have some things to say about my reading material at the moment so I might actually post twice in one day! We'll see. Girlfriend - a Little Valentine, a photo by megan_n_smith_99 on Flickr. Well my goodness. There is snow on the ground and as usual Seattle has ground to a halt. I really don't mind this year. In fact this is the 1st snow day in years when I did not have to trudge to work through the snow to answer the phones and keep an eye on everything. It is kind of nice - other than the whole income and health insurance issue. Yesterday I started watching The Big Bang Theory dvds and alternated between hoping I was not as geeky as the characters and wishing I WAS as geeky as the characters. Just in case we were snowbound for months like in The Long Winter by Laura Ingalls Wilder (unlikely!) I went out yesterday to pick up RXes and library books. Oh, and some good. The library books were the important thing! 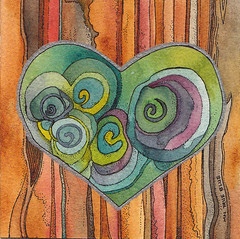 Two such colorful sweeties - this little painting would make a great Valentine for your sweetie or dear friend. Perhaps accompanied by a pink rose. Temple of Trees, a photo by megan_n_smith_99 on Flickr. This is a painting I worked on over the weekend, I think it was. I am afraid my days sometimes blur together, especially in winter when all I want to do is hibernate. I also watched the last Pirates of the Caribbean movie. I was more disappointed than I thought I would be. It's "inspired by" a novel by Tim Powers called On Stranger Tides but there is not much of Tim's story left. I mean I knew there would not be, after all Tim did not write about any of the characters from the Disney movies. Still, I hoped for a bit more. I first read On Stranger Tides when it came out in the late 80s. I love all of Tim Powers' books, It would be hard to pick a favorite, but if you are inclined to check him out I'd suggest the Anubis Gates and Declare as being two I especially liked. I am also very fond of his friend and sometimes co-author James Blaylock. You really cannot go wrong with any of theirs - though I am less partial to James' 1st trilogy (Balumnia trilogy) than his later work. The 1st trilogy is more traditional fantasy and does not show quite as much of the sheer originality that shows up in his later work. And I am not sure what any of that has to do with this painting, but I can hardly get myself to post anything without an accompanying picture. shades of white, a photo by megan_n_smith_99 on Flickr. 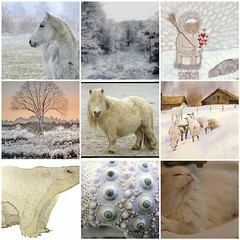 Here is a little winter inspiration for you. Click on the image to go to Flickr to see larger and get more information on these photos. Seattle, or I should say parts of the city, are receiving snowfall today. I think this is the 1st snow of the year? No, maybe there was another one, I forget. It does not seem to have amounted to too much and where I live, close to sea level, it hasn't stuck at all. It's interesting to sit by my window and look out at the hill across the ship canal from me in whiteout conditions but not much falling, and nothing sticking, where I am. But I used the weather as an excuse to lie in bed and read. I really meant to get some things done today but I did not sleep well and I was tired. Hopefully I will be more motivated tomorrow! And if we have to have snow I suppose I would not mind if a little stuck, for a little while at least! Jenny H is the winner this month! 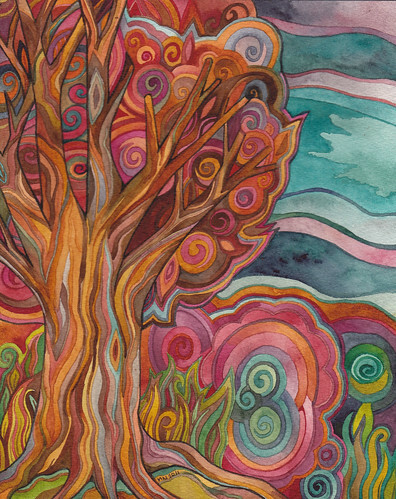 Stay tuned for another chance to win a piece of original art in early February. I am considering if it will be a painting or a small beaded item. Friends in Winter, a photo by megan_n_smith_99 on Flickr. Soggy snow is falling in Seattle. I wish I could say it was pretty but it has not quite reached the pretty stage yet. Actually it looks like sooty dirty snow is falling from the sky. And just for great timing there is also a burn ban on, though I hope the county will think about lifting it temporarily if there are power outages. This is my latest little painting. I actually thought these three friends were walking in the snow but it's a bit greenish. 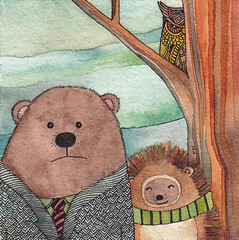 It's certainly winter since hedgehog has his scarf wrapped tight. Bear tends to run a bit warm and he's got his good tweed jacket on but did not feel a need for an overcoat. Owl is just wondering why he's even awake at the moment. He may have had too much coffee. This was inspired by my love of Richard Scarry. I still have quite a few of his books. My favorite part is searching each page for gold bug. The new versions have been redone to by more PC - there are female fire fighers and cops, the word "person" replaces "man", the dentist is no longer a scary looking creature but is now a snuggly looking teddy bear, and the father animals now help the mothers in the kitchen. 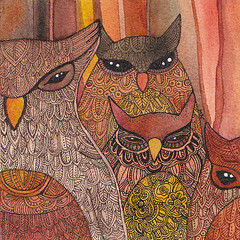 Parliament of Owls, a photo by megan_n_smith_99 on Flickr. I was feeling sniffly when I woke up yesterday and wondered if i was coming down with something. I am going to say yes, or that was what I was convinced of after i woke up from a long complicated dream involving time travel and Lewis Carroll. Also I think Lewis Carroll was cross-dressing. I felt a bit better in the evening though and finished this little painting while listening to the audio book of Gone-Away Lake by Elizabeth Enright. This was a favorite of mine when I was growing up. Two cousins stumble upon the ruins of a dozen old houses around a swamp. The swamp used to be a lake and the residents all abandoned their elaborate victorian houses when the lake went dry - that is all except a pair of plucky elderly siblings, Minnehaha Cheever and Pindar Payton. It's freezing out (okay, not quite literally but pretty close) and they say it might snow this weekend. I'll believe it IF i see it. The part of Seattle I live in is almost as sea level and it does not usually snow here even if it snows on some of the hills. Did you know what Seattle was built on 7 hills - like Rome? Only when I was looking that up I found out no one can even agree which hills are the 7. And one of them doesn't even exist anymore. It was dumped in the Puget Sound to make Harbor Island. Well, anyhow, people make fun of how panicked people in Seattle get when it snows, but really it's not much fun to deal with snow on HILLS. Tree Spirit, a photo by megan_n_smith_99 on Flickr. This little guy is something I painted .. I think last weekend. He is somewhat Inspired by Totoro. I think he probably has tea with Totoro often. Keep your eye out for him, but he's shy and hard to spot. The Little Book by Selden Edwards, the Glass Castle by Jeannette Walls, and now I am reading The Alice Behind Wonderland by Simon Winchester. A Little Nap, a photo by megan_n_smith_99 on Flickr. This is another little painting I finished recently. 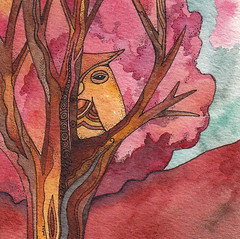 I have not yet tired of painting owls and trees and small forest creatures. This guy looks a little groggy but he's not used to being awake during the day time. I think I have an urge to paint more animals. What would you like to see? Rose Palace, a photo by megan_n_smith_99 on Flickr. I am still feeling under the weather but at least my paintings are colorful! I have been working on this one for a bit. I did not really know where it was going when I started out but then the towers started to rise out of the swirls below. Hide and Seek, a photo by megan_n_smith_99 on Flickr. Comment here for a chance to win this little creature. 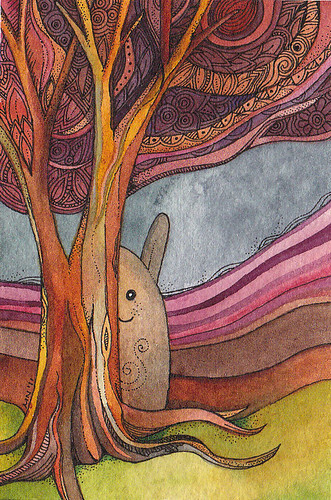 The painting is 4 x 4 inches, watercolor and ink on arches cold pressed watercolor paper (300 lbs). I will randomly select a winner on Saturday the 14th of January. I feel a bit better today but will be taking it easy. 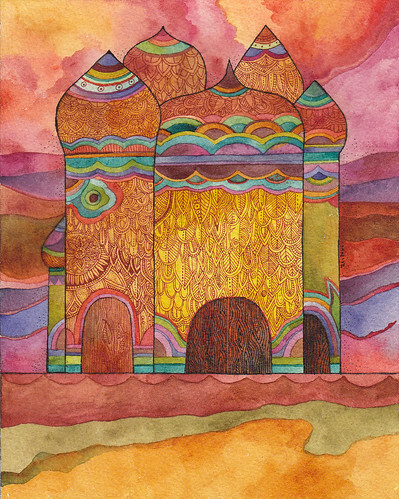 I am working on a 8x10" watercolor in the minaret series and i think I feel well enough to work on that for part of the day! I know a lot of people who read this have chronic health issues too. It's so draining, isn't it? Take care, all of you. Forest Dwellers, a photo by megan_n_smith_99 on Flickr. Yesterday my friend Janusz helped me go take down my art at Mosaic Coffeehouse in Wallingford (Seattle). Then we went and had pho - I can't believe he can eat a whole large sized pho- and then we ran a few errands. I don't think Janusz can walk past a library without going in and I had a book to pick up anyway. I was musing about libraries - I've been to 2 this week, in the middle of the day, and they were both PACKED. Here is Seattle we take out reading, dvd viewing, and cd listening seriously. No to mention web surfing and researching and I don't know all what else. I finished this painting last night. 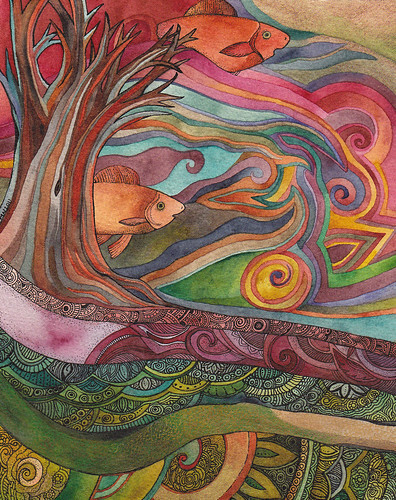 I have painted a number of paintings of fish swimming through the forest and I think it goes back to a dream I had when I was a teenager. A Magic salmon who granted wishes left my a little white box and I knew it was something wonderful but I never opened it. I guess I will never know what was in that box. I think today might be a day from pajamas. Tangerine Tango Imp, a photo by megan_n_smith_99 on Flickr. The holidays have come and gone and things are returning to some sort of calm in which I can paint. Well, actually it's 12th night tomorrow, which means I should take my tree down! It's fake so it's easy to put off taking down since it's not shedding needles all over. Did you know needles are specialized leaves? Well, they are. Anyway, here is a new little painting I am quite happy with. Tangerine Tango Imp. I was inspired by Pantone's color of the year. And she does seem warm and cozy. It has not been too cold in Seattle but it poured and poured yesterday when I was working on this so I probably needed a spot of color.